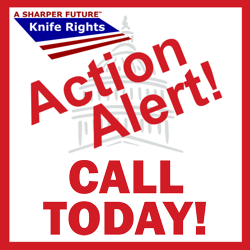 Knife Rights’ NY Gravity Knife Law Reform Bill to Gov. Cuomo CALL TODAY! Again, please be POLITE and RESPECTFUL and REMAIN ON POINT; just deliver the message, “I am calling to respectfully request that the Governor please sign A5667-A,” and then thank him. That’s it, keep it short, simple and ON POINT and above all BE POLITE and RESPECTFUL. In response to the Governor’s objections to last year’s bill, this year’s bill removes “centrifugal force” from the definition of a gravity knife and adds “solely” to create a bright-line definition that even overzealous New York City law enforcement and prosecutors can understand, as desired by the Governor. It would preclude the unconstitutionally vague “wrist flick” test that has resulted in over 60,000 arrests and prosecutions in New York City which the Governor himself described as “absurd” in vetoing last year’s bill.